She was born Mabel Loomis in Cambridge, Massachusetts on November 10, 1856; after her marriage in 1879, she was better known as Mabel Loomis Todd. More recently, some have called her the woman who destroyed the family of Emily Dickinson. William Austin Dickinson, the reclusive poet's older brother, entered into an affair with Todd while both were still married (she was nearly three decades younger). Mrs. Todd was very sexually open and, though her affair with Austin Dickinson was only one of many, it was the most passionate. After his death in 1895, she was given access to visit his body in private. In her journal, she wrote of how she had known and loved "every inch" of his body. Todd never met Emily Dickinson, though they occasionally corresponded. Todd referred to the reclusive poet as "the myth." When Dickinson died at the age of 55 in 1886, she had left no instructions for what to do with her scores of unpublished poems. 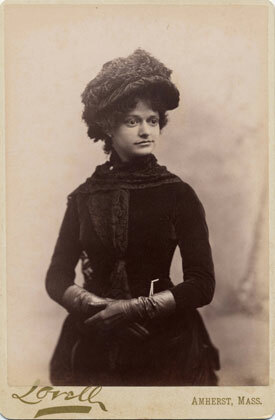 Her surviving sister Lavinia turned to Todd and Emily's supporter Thomas Wentworth Higginson. Todd commenced editing the poems by standardizing their syntax, punctuation, and structure. Family feud later ensued and Todd locked up her portion of Dickinson's manuscripts, where they remained unopened for half a century. Higginson was frustrated to work with Todd and has since gotten the bulk of the blame for re-writing Dickinson's poetry. Such was not the case, however; the real villain here is Todd, who herself admitted: "I changed words here and there in the two hundred [poems] to make them smoother — he changed a very few" (emphasis added). Higginson protested at one point: "I find with dismay that the beautiful... has been left out." The worst offense Higginson was guilty of? He insisted each poem carry a title. *Information from this post comes from Brenda Wineapple's White Heat: The Friendship of Emily Dickinson and Thomas Wentworth Higginson as well as Polly Longsworth's Austin and Mabel: The Amherst Affair & Love Letters of Austin Dickinson and Mabel Loomis Todd . Some additional information, including the image of Mrs. Todd above, is from the Emily Dickinson Museum (which I strongly recommend). Also, what a quote and story from her. Who says studying 19th Century writers is boring! Oh, yes. One of the reasons why most people refer to Dickinson's poems by numbers (rather than titles) is because of all that work that has been done to bring them back to the original version. If you see lots of dashes, that's her version. If you see periods, commas, and semi-colons, it's probably edited.